Dr DC Anjaria, independent director and former audit committee chairman of Gujarat International Finance Tec-City—GIFT City, had filed a fresh civil application demanding investigation of GIFT-City by Serious Fraud Investigation Office (SFIO), as has been ordered by the NCLT (National Consumer Law Tribunal) with respect to the beleaguered parent—Infrastructure Leasing & Financial Services (IL&FS). Dr Anjaria's original petition had alleged that this Rs70,000-crore GIFT-City project had virtually been gifted away to the private sector partner, IL&FS, leading to massive losses to the government and the people. He also alleged falsification in accounts, and incorrect recording of audit committee meeting at GIFT-City. The new application has also added names of fresh respondents, including a former Whole Time Member of SEBI (Securities & Exchange Board of India). In his civil application to the 2016 Writ petition No 260 of 2015 (PIL) filed last week, Dr Anjaria says, "...in view of findings of regional director, ministry of corporate affairs (MCA), Mumbai, that affairs of IL&FS and its group companies are carried out prejudicial to public interest, the affairs of GIFT-City are also required to be investigated by SFIO for two reasons. "Firstly, IL&FS has a 50% stake in GIFT-City and there it is part of the one of the group companies of IL&FS. Secondly, three senior directors on the board of GIFT-City are also part of board of directors removed by the National Company Law Tribunal (NCLT) at Mumbai. They are Hari Sankaran, K Ramchand and Arun Saha. The presence of these three persons on the board of GIFT-City is apparently inimical to the public interest,” Dr Anjaria added. He has also alleged that there was falsification of accounts by not recognising income against the guidance note issued by Institute of Chartered Accounts of India (ICAI) and falsification and incorrect recording of minutes of the audit committee meeting presided by him. "Ramakant Jha, the then chief executive of GIFT-City connived with Dipesh Shah, Head (IFSC & Strategy), GIFT-City and compliance officer for falsification and incorrect minutes," Dr Anjaria alleges. He says Haribhakti and Co, chartered accountant, did not recognise income from sale of development rights in spite of a guidance note issued by ICAI. Dr Anjaria says in the application, that it was incumbent upon Haribhakti and Co., as a member of ICAI to report non-compliance with guidance note by GIFT-City. The chartered accountant firm failed to discharge its duty and thus needs to be added as party respondent in the petition, he says. Taking cognizance of the massive financial debacle at IL&FS, Dr Anjaria, in a separate petition says these developments will "affect goodwill of GIFT-City project, which, in turn, will discourage international finance players and bring a great disgrace to the entire country where an IFSC of would class standards is envisaged." According the petition, out of four erstwhile directors of IL&FS, who are facing a lookout notice, two of them, Hari Sankaran and K Ramchand, are presently serving on the board of GIFT-City. "Apart from this, Ramesh C Bawa, who is also facing lookout notice, was also on the board of GIFT-City as representative of IL&FS. In view of this, there is palpable apprehension that these three persons would have also mismanaged affairs of GIFT-City and there is it is necessary to issue notice to IL&FS and it should answer charge against it," the petition says. Earlier, GIFT-City has failed to respond to our queries regarding Dr Anjaria’s petition and instead published an advertorial in the form of an interview in the Business Standard. The paper later published a rebuttal by Dr Anjaria. Moneylife has written to Prof JR Varma and the Gift-City management for their comments. This article will be updated with their response as and when we receive it. Is GIFT City Gujarat’s Gift to IL&FS through One-sided Deals? ILFS mess was created over a period with the support and connivance of so called eminent board members and the auditors/CA firms. Let there be a forensic audit and the role of both internal/ nominee/ independent directors and the audit firms be critically examined because it is very much possible that these people wanted to look aside and their silence/ approvals were purchased at a cost. The truth should come before the nation as these tainted directors are spreading their tentacles in many other companies and are playing with the public trust. Khaunga aur apne doston ko bhi khilaunga. Legalising corruption. Sunil Rebello 5 days ago The base problem of IL&FS is the GIFT city. We may say that IL&FS is not a PSU but it always acted as a quasi PSU. This tactic is the clear example of our present government - shoot the messenger. This is also exemplified in their name changing spree all over the country. Now the whole weight of government authorities - RBI NCLT SIFO CBI ED etc etc are on IL&FS head. But do they have expert advise or are they depending on the crap advise of the present Financial & Law team. To change some major scam - you have to first accept that there is a scam. IL&FS was not paid by the GOI for their work, Therefore the GOI takes it over. IL&FS Mess: Can SFIO do Justice to the Probe with its Dwindling Staff? The government has got the Serious Frauds Investigation Office (SFIO) to take charge of IL&FS’s servers in Mumbai and has started an audit. 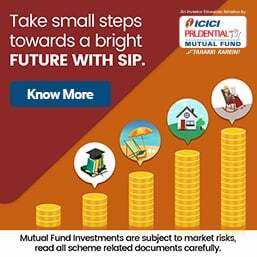 Unfortunately, the SFIO is a lame duck, with most of its investigations and findings unceremoniously buried by the Ministry of Corporate Affairs (MCA). Moreover, SFIO simply does not have the manpower to takeover any new investigation due to pendency of cases. Out of 186 cases assigned to SFIO during FY2018-19, it had completed investigation only in one case as on 20 July 2018 due to a 55% shortfall in staff strength, data from the Lok Sabha questions shows. Earlier, in August 2017, in response to a question in the Lok Sabha, the Union Minister of State Arjun Ram Meghwal provided summary of 233 fraudulent finance companies and chit funds that the SFIO had investigated over the previous five years. He also admitted, “No money in these cases has been restored back to the investors”. PR Senthilnathan, a member of Parliament (MP) had asked about action taken by SFIO against fraudulent companies and refund of money to victims by fraudulent companies and chits funds. As per the list, maximum number of fraudulent companies (132) were from West Bengal followed by Orissa at 31. With many insiders starting to allege that top executives of IL&FS were gold-plating projects to create their own pot of gold, an investigation is clearly warranted. But unless the SFIO is asked to work in a time-bound manner and report directly to the Prime Minister’s Office (PMO), the outcome will be no different this time. 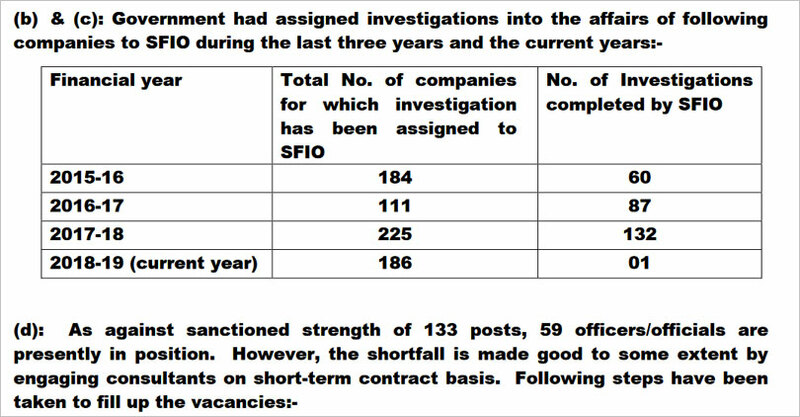 What is more shocking is as against a sanctioned strength of 133 posts, SFIO has only 45% or 59 officials working on various cases and use services of external consultants. Due to this, over the past three years, SFIO was even unable to spend budget sanctioned. While during FY2018-19, its budget was increased four times to Rs62.22 crore from Rs17.37 crore past year, as on 30 June 2018, it could spend only Rs4.71 crore. This was informed by PP Chaudhary, Minister of State for Corporate Affairs while responding to a question in the Lok Sabha on 20 July 2018. Mr Chaudhary also told the Parliament that during the past three years, 94 complaints and prosecutions were disposed of by the various courts by levying a total fine of Rs5.9 lakh or Rs6,276 per case. Since its inception in 2003, SFIO had investigated 312 cases till 2016-17. According to information provided by Ministry of corporate affairs (MCA) to a Parliamentary Panel, only six convictions, including those in the Satyam and Reebok case, had fructified out of 162 investigations completed till March 2015. In short, over the past 12 years, the conviction rate of SFIO is just 3.7%. In contrast, the conviction rate of UK’s SFO on whose lines the former is modelled, was as high as 85% as per its progress report submitted on 23 June 2014. Coming back to the IL&FS mess, the reconstituted board has to submit a resolution plan to the NCLT (National Company Law Tribunal) by 31 October 2018. Many Indian and international experts, point out that IL&FS has been largely and infrastructure play in the private sector and cannot be given special treatment just because it masqueraded as a quasi-government body. If the rating agencies or banks treated it as one, they ought to be hauled up. It holds assets of around Rs1,65,000 crore of which a whopping Rs30,000 crore are at risk, according to data analysed by REDD Intelligence. Banking analyst Hemindra Hazari has written about how the complete erosion of IL&FS’s networth has been disclosed in the consolidated balance sheet for several years. While responding to Rahul Gandhi’s allegations that more and more financial scams are coming out under the watch of the current regime, finance minister Arun Jaitley claimed that the problem of Infrastructure Leasing & Financial Services (IL&FS) is a creation of the Congress regime. However, the debt levels in IL&FS dramatically rose in the past two years when the Bharatiya Janata Party (BJP)-led National Democratic Alliance (NDA) has been in power. Its leverage rose by 59%, from 6.1 times in March 2016 to 9.7 times by March 2018, according to REDD Intelligence, which has pieced together the total picture of assets and liabilities of the group from publicly available information. REDD stands for Risk Event-Driven and Distressed. It is a leading provider of material intelligence on emerging market event-driven special situations. 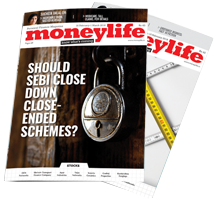 Moneylife has reviewed its research on IL&FS. There are massive related party transactions and inter-corporate lending, which makes it very difficult to penetrate this behemoth. IL&FS’s exposure to associates through loans and receivables was Rs5,500 crore and another Rs600 crore were given as guarantees. For the year ended March 2018, IL&FS reported a loss of Rs2,200 crore, eroding 22% of the company’s book value in just one year. It was so deep in trouble that even its interest cost at Rs7,920 crore was more than earnings before interest depreciation and taxes of Rs7,200 crore. On Monday, the government sacked six independent directors and appoint new directors on IL&FS board after it appeared that this massive institution had become a threat to the financial system when it started defaulting on its short-term debt obligations. It has never been clear what are the total assets and liabilities camouflaged in the holding company, IL&FS, and hundreds of subsidiaries and associate companies. Well, this figure is way off the mark. In a press conference on Thursday, Uday Kotak, the new chairman of IL&FS disclosed that there are 348 entities in the group. There is so little information in public domain that despite its painstaking effort, even REDD did not have complete visibility about this sprawling hydra-headed conglomerate. According to REDD, IL&FS group has 175 subsidiaries and 66 associates – in all 242 entities – far more than 169 companies according to the ministry of finance but far less than what the Mr Kotak revealed. According to REDD, the group holds assets of around Rs1,65,000 crore. The corresponding total liabilities is around Rs1,32,000 crore. The reported consolidated liabilities at IL&FS (holding company), is around Rs1,06,500 crore and inter-group liabilities is around Rs25,500 crore. Similarly, inter-group assets comes around Rs49,000 crore, indicating an equity of Rs23,500 among the group companies. According to the data compiled by REDD, IL&FS has total assets of over Rs1,00,000 crore in its operating subsidiaries. Of this, around Rs25,000 crore is in financial assets and the remaining is in non-financial assets, spread across energy, road, international, maritime, rail, township, educational and other assets. and are playing with the public trust.